About 257 million people worldwide are chronically infected with hepatitis B virus (HBV) and even though a prophylactic vaccine and effective antiviral therapies are available, no cure currently exists. HBV kills more people than Malaria. Chronic HBV (CHB) infection results in 887,000 deaths per year from cirrhosis and liver cancer. No known cure for CHB exists due in part to the continued presence of a viral reservoir which is not targeted by current therapies. CHB persists despite even the best treatment and risks of liver cancer remain. Current treatments must generally be taken for life to remain effective and only 8% of people living with CHB have access to them. This high burden of disease, in spite of the availability of effective interventions to prevent infection and adverse outcomes in those affected, warrants a coordinated public health approach to cure CHB. Leading causes of mortality and trends, 1990-2013. 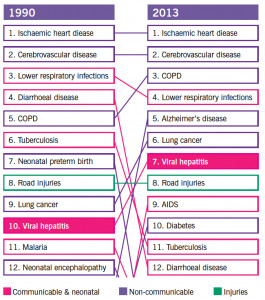 The global burden of viral hepatitis from 1990 to 2013: findings from the Global Burden of Disease Study 2013. Stanaway, Jeffrey D et al. The Lancet , Volume 388 NB: HBV causes approximately half of all viral hepatitis-related deaths.